This week we’ve got two podcasts for the price of one. In the first podcast Cammy, Rory and Iain look back at Scotland’s win over Canada and carry out some indepth investigations into the mystery around Adam Hasting’s parentage. In the second episode we look at the latest goings on in the world of Scottish rugby and things get really dark as we discuss Glasgow season tickets and the Keith Russell revelations. The podcast is available on Apple Podcasts, Acast, Spotify, TuneIn and Audioboom as well as anywhere else that will let you subscribe through an rss feed. You can also just listen through this webpage using your desktop, laptop, tablet or mobile device. “Comment of the week” – We’ll be picking out our favourite comments from articles across the blog. “Hands in the ruck” – What’s had it’s hands in your ruck? Let us know in the comments and we’ll pick out the best ones. “Where’s Dougie Donnelly?” – It’s now mandatory to have a rumours section in a rugby podcast (apparently) so we’re looking for yours as well as news of any Scottish sporting media personalities you’ve spotted out and about. Have you seen Dougie Vipond down Tesco? Has your uncle’s brother’s aunt’s friend heard from someone down the pub that Jonny Gray is getting a new fence put in? Has your plumber been doing some work round Murrayfield and seen Richard Cockerill taking delivery of a new yoga mat? If so then let us know. 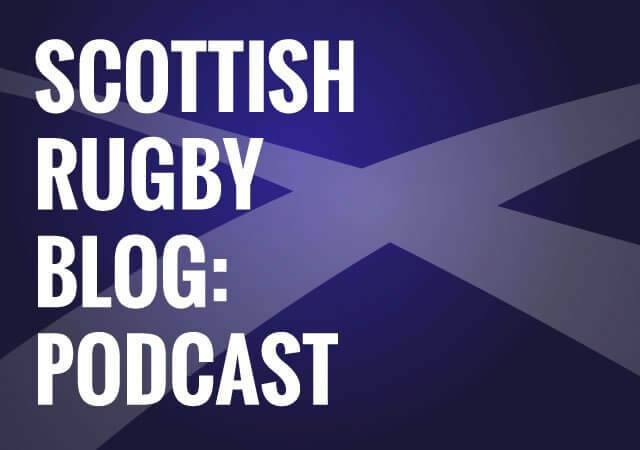 If you want to get in touch you can e-mail us on podcast[at]scottishrugbyblog.co.uk, catch us on Twitter @ScotRugbyBlog or @CammyBlack or you can leave a comment below and we’ll pick it up there. Are Glasgow going to sign anyone? It’s all gone quiet over there. Glasgow have been slimming down their large wage bill , still one massive wage on the books, It is a business after all. With Strauss and Russell away the wage bill must be healthier. Glasgow can surely afford players. Hogg is a big wage , big talent so he wont be going anywhere soon. Finding guys who can play with him is the challenge. Rennie said after the Scarlets game he was looking to bring in about 7 new names and I guess David Tameilau is one of those. He said the others were done but hadn’t been announced. I guess they’re waiting for guys to get back from their summer break and maybe even summer tours. This is pure speculation but I’m guessing Luke Hamilton will be announced after the summer tour unless he signs for another Premiership side as he’s officially left Leicester and Edinburgh are bursting at the seams in the backrow. He can play lock as well which might give a bit of extra depth and versatility to the Glasgow scrum. The two academy players will likely count towards that total as well (Bruce Flockhart and Robbie Nairn). Hamilton doesn’t seem tall enough to play lock – he’s ‘only’ 6’3″. Swinno is 6’4” isn’t he?